Well, another week survived! This one went quick and without a lot of annoyances, which makes me nervous about what this next week may bring. But hey, I got a few beers in on the long train ride home, and a few margaritas in at dinner after so let’s start this weekend. So I will start out by saying that I ended last weekend by getting a good deal on Dune 2000 (PS1) from eBay. By Tuesday though I get a message from eBay that the order was cancelled by the seller, and my money refunded. WTF! So even though all that took place on Tuesday it would take till Saturday morning to get the reasons behind it that being the “item was broken or out of stock”. I think what it really came down to is someone offered him more after the sale, and he cancelled with me to sell it for the higher price. Wizards and Warriors 3 (NES) – I have two backlogged NES games and I’m hoping to get a good old fashion weekend of NES and SNES games coming, just have to get enough of them. Anyway, I have the other two W&W games, and this one has been on my wishlist for a while to finish off the series. Crime Killer (PS1) – A Twitter follower of mine turned me onto this one early in the week, and I found an auction on this one ending on Friday believe it or not. Looks interesting, and a bit obscure. Pokemon Ruby (GBA) – This one I won’t be covering since it’s for my eldest son, who’s having a Pokemon thing right now. Pokemon: Team Rocket Edition (GB) – Again not covering it for the reason above, but an interesting buy none the less. Break Out (PS1) ⭐️⭐️⭐️⭐️1/2- This is another PS1 Hasbro/Atari reboot. Unlike the others this one starts out with a rather cute story and plot coming in. From that point on the game itself took a direction I didn’t expect it, and became a cool story about the Break Out paddle “Bouncer” as he sets out to save his friends from the evil Batnix. There are traditional Break Out elements thrown in but they serve the overall story. Graphics wise this one is a prisoner of its era, but I will admit looks pretty good considering, and solidly holds up. Control wise this game is easy to control, but do to the nature of the game takes some time to master. I have to say of all the reboots, this one is the most original and really worth adding to your collection. Atari Anniversary Edition Redux (PS1) ⭐️⭐️⭐️⭐️- This is a compilation of 12 different Atari arcade games for the PS1. 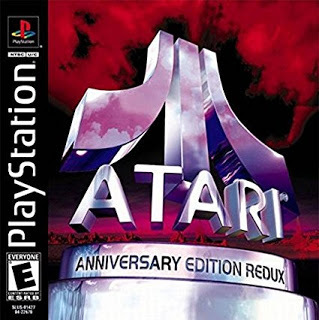 Not much to say since these compilations have been done over and over and the original games are always the same. I won’t comment on graphics since this is basically emulation. Control wise however things were lacking, and it’s obvious it didn’t port to the PS1/2 controller well. Battlezone for instance was a complete mess. Blasto (PS1) ⭐️⭐️⭐️⭐️1/2 – This game has the unique honor of being one of legendary comedian Phil Hartman’s last works. Based on that alone and how much I liked Hartman’s work this one gets bonus points. 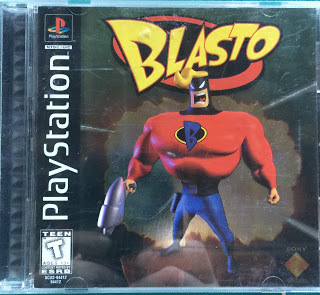 Anyway, Hartman plays the title character Blasto a deliberately cheesy space opera hero with catch phrases galore. Listening to Hartman voice this character and the overall humor of the game is kind of worth it alone. The main villains of the game remind me of the little plant people from Pikmin, so look for that. Graphics wise this one looks really good and could pass for a PS2 game, keeping in mind of course it’s supposed to be cartoony. Everything is very solid and well done graphically. Control wise it allowed me to use my analog sticks, which is always a major plus, and I had very minor camera issue’s. 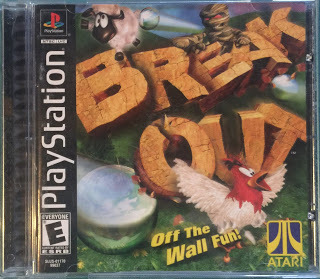 Originality wise, this game has it in spades, and it’s easy to see why it makes a lot of PS1 top ten lists. 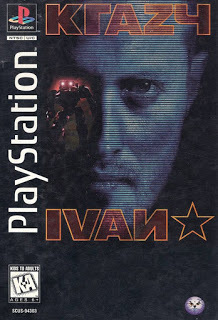 Krazy Ivan (PS1) ⭐️⭐️⭐️- This is an early tall box PS1 game, and has some FMV goodness right up front in the intro. 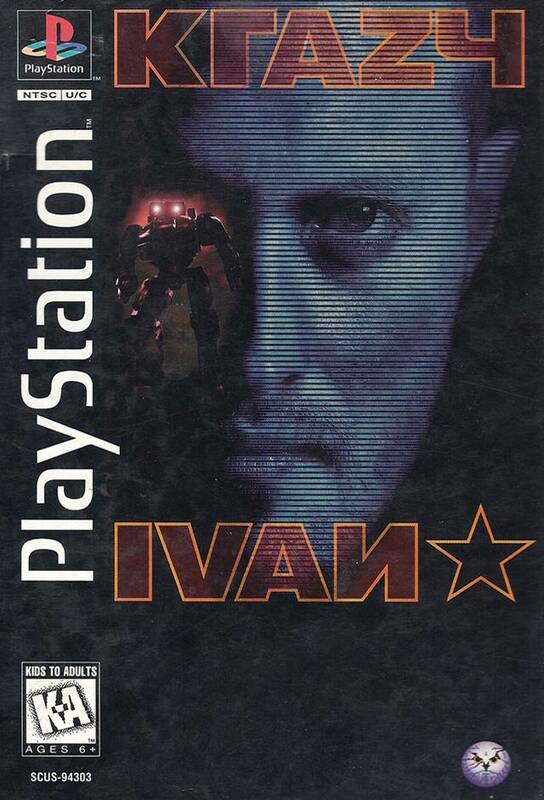 If you never heard of it before the game is about a Russian mech pilot, the titular Krazy Ivan who is fighting giant aliens in Russia. Graphics wise this one is a prisoner of its era, and is on par with titles on the Jaguar, and 32x, but still a little better than the N64. What it truly reminds me of is an arcade game of the era, and it has the feel of a quarter muncher alá 1995. Control wise it was d-pad only for control with the mechs attitude awkwardly adjusted by the R1 and L1 buttons, giving play a feeling of being somewhat disjointed. Originality wise, it has some I’ll admit, but it also seems like every console in that era had to have a mech title on it. on or near launch making this title a bit of white noise. I’d pick it up if you’re a tall box collector, or a fan of arcade like mech games of that era, but otherwise you’ll do ok without this one. Final Fantasy VII (PS1) ⭐️⭐️⭐️⭐️ – This ones reputation precedes it, and having played it on iOS before I was familiar with most of it coming in. 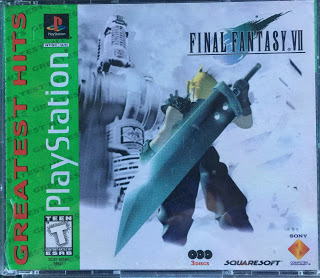 For many FF7 is believed to be the finest of all the Final Fantasy games, which is why the game can command a premium on eBay especially in its original PS1 packaging. Of course I cheaped out and bought the green greatest hits version instead because it’s the same GD’d game. There are a million play-throughs on YouTube so if you’re curious about the game please see one of those, since I’m going to avoid talking about the games plot since well…it’s easy to find a synapses. Graphics wise it seems like Squaresoft was a little uncertain which direction to go in since the “dungeon crawling” characters look very, very cartoony, yet the combat characters look kind of badass and normal. Either way though the graphics are fairly good, and being from Square they are well designed, and quality made. Now, just being able to use a controller for the game is a step up (for me) from the iOS version, and play was a lot easier. There were a few things I didn’t like though for instance the d-pad only control, and the fact that O rather than X, was the primary action button. My guess is that it made more sense to make X the run button over O, since the run action is used more. Originality what can I say, it’s a Final Fantasy game and each one is so different and unique it’s hard not to have originality. Overall, this is a suggested buy. 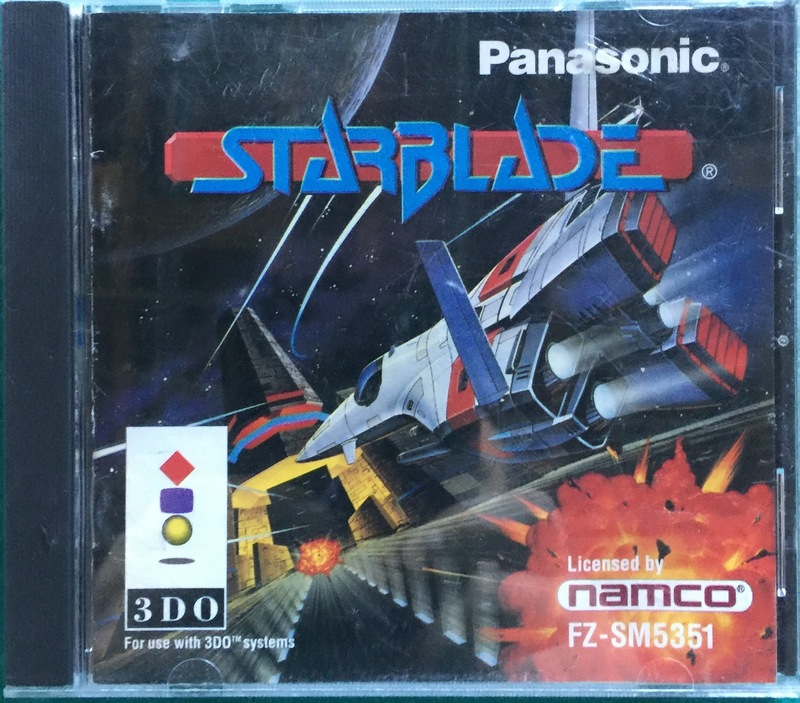 StarBlade (3DO) ⭐️⭐️⭐️⭐ – I originally spotted and eyed StarBlade as a game to add to my Sega-CD collection as I attempt to build it. However, after watching play-throughs of the Sega-CD, PS1, and 3DO versions, it looked like the 3DO had the best port. In a way StarBlade reminds me of my last 3DO play, Burning Soldier, and admittedly they’re alike in a lot of ways since both are rail shooters where all you really do is aim and fire while the starfighter flies and maneuvers itself. With that said though, StarBlade is definitely evolved beyond Burning Soldier and looks considerably much better, with the crispness of something like Star Fox 64. Control wise it runs very smoothly and intuitively, albeit the targeting could move a little faster, On the basis of originality I would detect the influences of both Star Fox 64 and Burning Soldier, had I not known the fact that StarBlade despite its 1995 home console release, actually dates back to a 1991 in arcade game preceding those other games. Collecting for the 3DO, I would definitely say this is one to pick up. To be honest I’m glad I finally wore down my PS1 backlog, although I have another title coming this week and more than likely I will smile a little more on the PS1 in coming weeks. I know next weekend has some plans involved in it, especially Sunday, so playtime may or may not come to fruition. For now though outside of a few NES games awaiting play, I do have significant backlog of vintage computer games for the Apple II, and C64 which might spell out another Vintage Computer Weekend in the upcoming weeks. Also, I have some recording equipment coming so maybe I can begin to share some plays with you guys soon. Until then, I have another excruciatingly long week coming up so try to keep it light guys and I will see you next Friday night hopefully!! God bless, and have a good week! !